The deputy under secretary for management sent out an urgent message saying most employees will be back to work on Tuesday. 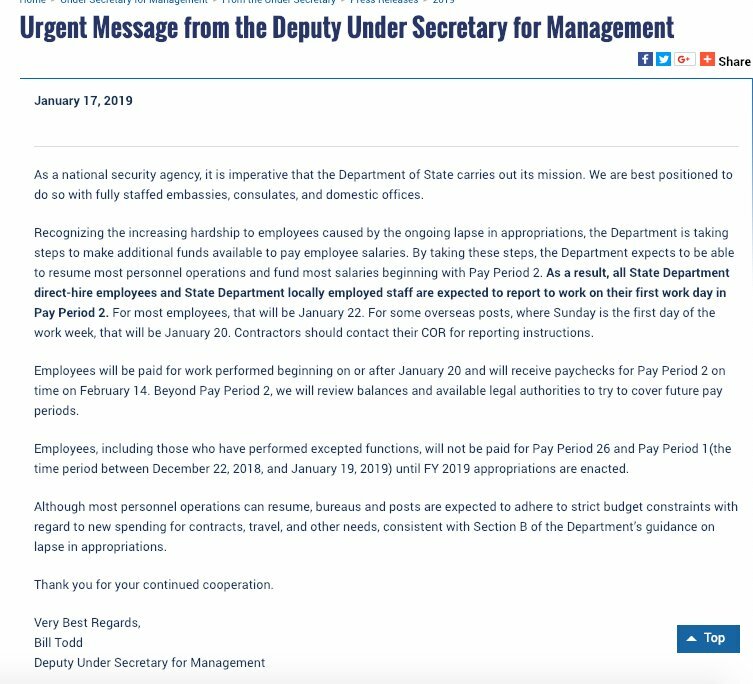 Good news for State Department employees: The department is ordering its employees back to work and says it's going to pay them despite the partial government shutdown now stretching into its 27th day. In an urgent message Thursday, Deputy Under Secretary for Management Bill Todd said employees "will be paid for work performed beginning on or after Jan. 20 and will receive paychecks for Pay Period 2 on time on Feb. 14." Todd also said as a national security agency, it's important that the State Department carries out its mission. He said the department is "taking steps to make additional funds available to pay employee salaries." Most employees will be going back to work on Tuesday.